If New York wants to be a progressive model for the country, its voting laws should reflect that reality. That’s why it’s time to pass automatic voter registration, a reform that dramatically increases the comprehensiveness and accuracy of voter rolls. Automatic voter registration has been implemented across the country with bipartisan majorities in states like Alaska (through a ballot initiative), Maryland, Rhode Island and Massachusetts. Our preferred bill is S1278, a back-end system with a large number of source agencies. Read our latest letter to Governor Andrew Cuomo, Majority Leader Andrea Stewart-Cousins and Speaker Carl Heastie with Demos, Center for Popular Democracy, Make The Road New York, New York Communities for Change, Heather McGhee and local Indivisible groups calling for back-end automatic voter registration to protect immigrants and expand electoral participation. Read our letter to Governor Andrew Cuomo, joined by 1199 SEIU, 32BJSEIU, AVR NOW, Center for Popular Democracy, Common Cause New York, Empire State Indivisible, Indivisible Harlem, Make the Road New York, Stand Up America and Working Families Party. “Politicians of all stripes have enacted laws to make it especially difficult for people of color, low-income citizens, and young people to vote, and it is crucial that we pass voting reform, including automatic voter registration in New York. We as state legislators have a moral responsibility to make voting more accessible to everyone.” - State Senator-Elect Zellnor Myrie, incoming chair of the Senate Elections Committee. “New York is a global leader in innovation and our vibrant civic culture is a model for states around the country. However, when it comes to voting and election law, our state is behind. For New York to truly remain a leader, we must modernize our elections. Automatic Voter Registration would be an important and effective step towards this goal.” -Julie Samuels, Executive Director of Tech:NYC. To be frank, New York’s electoral system is a national embarrassment. Our state scrapes the bottom of the barrel when it comes to turnout. While the national voter turnout in the 2018 midterm was about 50 percent, only 42 percent of New York’s eligible voters cast a ballot. That means that New York’s voter turnout was an embarrassing 48th out of 50 states this year. New York law requires voters to change their party registration more than a year before Election Day if they want to participate in a party primary. New York is also one of 13 states where early voting is unavailable, and the state’s absentee ballot laws are among the most restrictive in the country. In the run-up to the 2016 primary, a voter purge deleted over 200,000 names from voter rolls due to errors at the New York City Board of Elections. On election day in 2018, voting machines crashed all over New York City, resulting in citizens waiting in line for hours to cast their ballots. For all these reasons and more, New York needs to reform its election procedures. Passing Automatic Voter Registration is the essential first step in transforming one of the worst voting systems in the nation into one of the best. New York needs to modernize its voting systems in order to protect and expand access to the polls NOW. If our state wants to continue to claim itself as a progressive model for the country, its voting laws should reflect that reality. That’s why it’s time to pass automatic voter registration or AVR. AVR is a simple change where when you interact with a state agency like the DMV or Department of Health, your current information is used to either automatically register you to vote or update your registration if you’ve moved. All the data is handled electronically on secured servers to ensure that our voting rolls are safe and that you never have to worry about being turned away from a polling place and not having your voice heard. Automatic voter registration has been implemented across the country with bipartisan majorities in red states, purple states and blue states. The need is there as well. 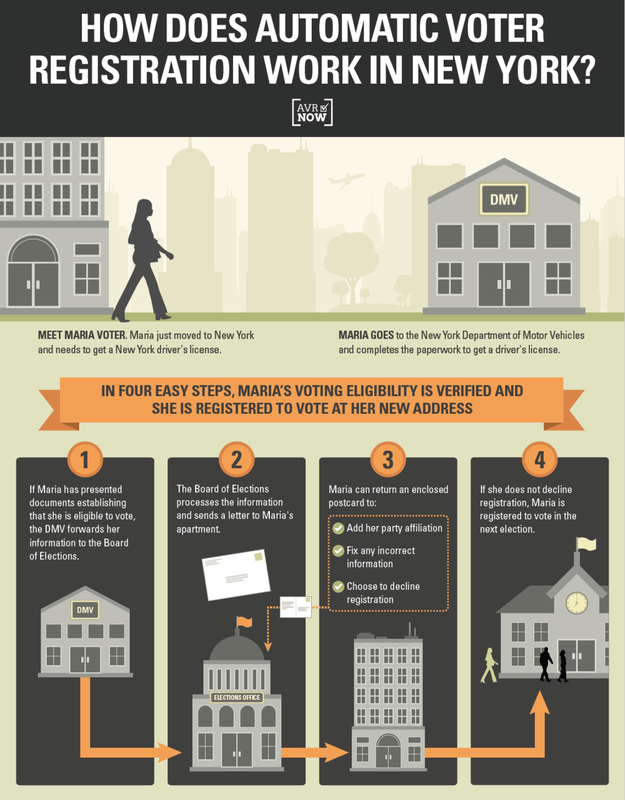 In addition to those who have been purged, millions of New Yorkers are unregistered. Studies suggest that millions of Americans are disenfranchised by registration deadlines. Most of us don’t buy a Mother’s Day gift until the last minute, and if we procrastinate on that, it’s not surprising that millions of people become engaged to vote after the 30-day registration deadline in New York. These registration barriers disproportionately disenfranchise underrepresented voters such as lower-income citizens, young people and people of color. Let’s make 2018 the last election run on such an archaic system. We need automatic voter registration now. AVR NOW is a new advocacy group dedicated to passing automatic voter registration (AVR) legislation in New York State. AVR NOW is led by Sean McElwee. McElwee, cofounder of Data for Progress, focuses on bringing cutting edge data analysis to progressive advocacy. Named to the “Politico 50” list in 2018, McElwee’s work has been cited by policymakers at the national, state and local level. His writing has been featured in the New York Times, the Atlantic, Vox and the Washington Post and he’s a contributor to The Nation. AVR is extraordinarily popular in New York – 2018 Data For Progress/Civis Analytics polling shows that 64 percent of likely voters in the state support the policy, as do majorities in almost every New York State Senate district. Read the polling here. Download the Department of Motor Vehicles Infographic. Automatic Voter Registration is a policy that simplifies and streamlines the way Americans register to vote. Eligible voters are automatically registered to vote when they interact with a government agency, such as the Department of Motor Vehicles or the Department of Health. Using data that individuals are already providing to these agencies (name, age, address, and citizenship status), eligible voters are registered by default but are given the opportunity to opt out afterward. All data is handled electronically to ensure voter rolls are accurate and up-to-date. For those already registered who have changed their address, AVR will automatically update the address when individuals interact with a participating agency. Automatic voter registration has been passed in Alaska, California, Colorado, the District of Columbia, Georgia, Illinois, Maryland, Massachusetts, New Jersey, Oregon, Rhode Island, Vermont, Washington, and West Virginia. Under Oregon’s AVR program, 94 percent of individuals who have interacted with the DMV and were eligible to vote were registered. A full 44 percent of the new registrants subsequently voted, leading Oregon to have the largest turnout increases between 2012 and 2016 of any state and one of the highest turnout rates in the country in 2018. What is the wider impact of AVR? AVR policies have proven successful in states across the country. In Oregon, the first state to pass and implement AVR, 94 percent of individuals who interacted with the DMV and were eligible to vote were registered. Additionally, across the country, localities have saved an average of about $3.54 in costs per registration by moving from a paper to an electronic method. One study in Arizona showed that it costs $0.83 of staff time to enter a paper voting application into the system, compared to just $0.04 with an electronic system. See our full guide to to AVR here. Read a memo from election lawyer Henry Berger explaining why he thinks back-end is best for New York. Read a letter from AVR NOW, Center for Popular Democracy, Common Cause, Make The Road, Working Families Party and Indivisible on why we demand back-end AVR. Read a letter to Governor Andrew Cuomo from AVR NOW, 1199 SEIU, 32BJSEIU, AVR NOW, Center for Popular Democracy, Common Cause New York, Empire State Indivisible, Indivisible Harlem, Make the Road New York, Stand Up America and Working Families Party.